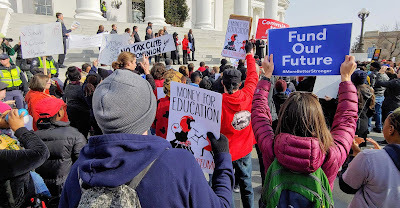 RICHMOND, VA, Dec. 8 -- Around 800 parents, students and Richmond Public School employees braved a cold morning today to march and rally, demanding the Virginia General Assembly allocate more money for Richmond Public Schools. The protest, organized by Richmond Mayor Levar Stoney and RPS Superintendent Jason Kamras, began with a rally at the Martin Luther King Jr. Middle School in the East End, followed by a march across the King Bridge to the State Capitol, where more speakers addressed the crowd. The 2019 session of the General Assembly opens Jan. 9. A teacher-led “Red for Ed” march on the State Capitol has been called for Jan. 28. 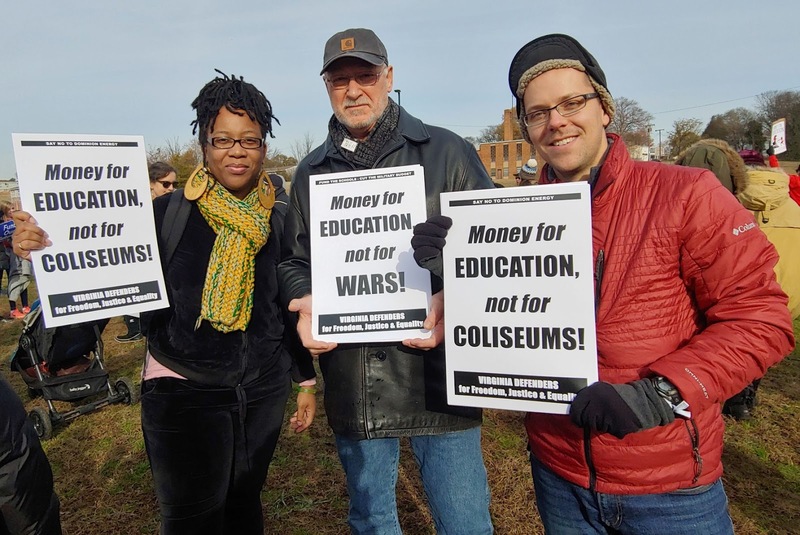 Prominent in the crowd today were signs demanding money for education and not for the controversial, public-private Coliseum project, which many feel would siphon tax dollars away from public schools and into the pockets of wealthy developers. That project is led by Thomas F. Farrell II, the president, chairman and CEO of Dominion Energy, which also is the major force behind the even more controversial Atlantic Pipeline Project. The Coliseum project is being heavily promoted by Mayor Stoney. Channel 6 (CBS) news gave a fair amount of coverage to the anti-coliseum signs at the protest, while noting that everyone present supported the demand that the state provide more funding for local schools. According to the Richmond Times-Dispatch, state funding per student in Virginia is down 9 percent compared to just before the Great Recession, despite the fact that overall enrollment is up 5 percent. In Richmond, state spending is down 19 percent, while enrollment is up 9 percent. Meanwhile, total funding for the Department of Defense has more than doubled since 9/11, while half of all federal tax dollars now go to wars, preparing for wars and paying for past wars. … that Thomas F Farrell II, president, chairman and CEO of Dominion Energy, is the highest paid executive in the entire utility sector? That’s according to the website Investopedia, which reports that Farrell is paid “roughly $20.6 million a year.” Working a 40-hour week, that would be $9,903.84 an hour. And that would mean that every hour-and-a-half he is paid as much as a minimum-wage worker earns in a year. This story and more photos were posted on Facebook.